Charlie Baker approaches the crisis in housing affordability with all the integrity of Annie Dookhan approaching a drug test at the state labs. “Rent control will stifle the production of new housing”. (quoted in today’s Globe). Notice what Baker didn’t say: He didn’t say “Rent control will interrupt the wonderful progress we’ve made in making housing affordable” (because affordability has all but disappeared). He didn’t even say, “Rent control will undermine all the progress we’ve made developing housing” (because such progress has been scant, to put it mildly). Rent control was outlawed in 1994. For 25 years the Commonwealth has tried the free market approach to housing affordability. You would think after 25 years Baker et al. would feel some obligation to defend the results of this approach, instead of reciting the real estate industry’s pet line. Since rent control was abolished, the short term effects have been the same as the long term results–unrelieved misery. The real estate industry has weaponized deregulation to displace poor people and gentrify neighborhoods. Rent control won’t “stifle the production of new housing” Charlie. It just might stifle the displacement of tenants from gentrifying neighborhoods. The 25-year experiment in free market shelter has been a bust. It’s time to start protecting at least some tenants from its worst effects. Sorry–extra comment as I tried to make the image appear as a wordless reply to this post. I suppose I have spoiled the effect now. Yes, theoretically you get less housing supply if you introduce an external price control. There are so many complicating factors to housing — zoning, income inequality, government incentives, investment vehicles for wealthy funds, environmental factors — that I’m not sure how illuminating this is under the circumstances. I’m quite certain we need *more* housing. Where, and for whom, is a moral and political question, and how to supply it seems like a super-technocratic question. If rent control is a blunt instrument with unintended side effects, then surely just “more supply” is also that. Yes, it’s complicated, but the answer to “how to get more housing” is most definitely not “cap prices.” Some people are asking a different question: “how to avoid new renters or buyers displacing incumbent renters.” It’s funny to think of tenants as “rent-seekers” in the economic sense, but there you go! “how to get more housing”…is the same as “jobs and the economy!”….and more jobs! No one dares ask the question about housing that one can afford or what the wages of those new jobs will be. Again, if we simply valued labor more than we do, this problem would correct itself. Neither party is willing to do so. Well, the figure posted by tedf offers insight into why neither party is willing to do so. The value of labor is set by supply and demand, as is the rental rate for a given property and, for that matter, the price of a gallon of gas on a given street-corner. Price controls imposed by government NEVER work. Gas price freezes were tried, and failed miserably. Rent control was tried and failed. Wage and price freezes were tried and failed. The reason that minimum wage doesn’t meet the same fate is that the minimum wage levels we have are so far below the equilibrium labor price that they have little impact on the market (that’s why they work!). If the government (either party) attempts to make the minimum wage higher than the prevailing market rate, the result will fail just as miserably as price controls on gas, rent, and food. Yes, and it’s time we abandoned that when it comes to human labor, eh? Price controls imposed by government NEVER work. So we’re okay with price controls by the wealthy class? That’s working? is it only by the externalization of true labor costs that today’s economy operates as it does, by transferring the lion’s share of the bounty to the owners, the wealthy class. If the ownership class refuses to pay its workers enough to pay the rent for the housing that the ownership class is renting, the idea that we ask the government to make up this difference is adding insult to injury. It might be nice if we could abandon F=mA or V = iR. Many things would be different if the acceleration due to gravity were something different than it is. We must live in the real world and adjust our behavior to those realities. One of the realities of the real world is supply and demand. It doesn’t look as though you actually looked at the figure posted by tedf. An attempt to force the price somewhere other than its equilibrium point — whether by government, wealthy class, or working class — will cause either excess demand or excess supply. Neither is good for the working class. That is WHY it’s an equilibrium point. [It is] only by the externalization of true labor costs that today’s economy operates as it does, by transferring the lion’s share of the bounty to the owners, the wealthy class. I enthusiastically agree with this. This is quite true, and this is something that can and should be adjusted. Child labor laws, right-to-work laws, federal protection of labor negotiations, health care, and so on all improve this and we should do more of all of those things. This is, in fact, HOW to accomplish a sustainable living wage. The supply/demand equilibrium mechanism will continue to set both rents and wages. Government action to, for example, force employers to capture more of their currently externalized labor costs is one effective way to adjust both. This whole supply demand thing is a mirage, Supply is manipulated by lawmakers. It is not “gravity”. Calling it the “real world” is only because we made it so. We can make it be otherwise. Our lawmakers can decree that “30 Hours” is the new standard for full time and that will affect supply to the benefit of labor. Jeesh, we seem to have some serious math-phobes here. It is not a mirage, it’s simple algebra. It’s taught in undergraduate economics and has been for at least forty years. I think you’re just using this as an excuse to repeat the same things you’ve been writing for years. Supply and demand is not a mirage, as much as you might like it to be. 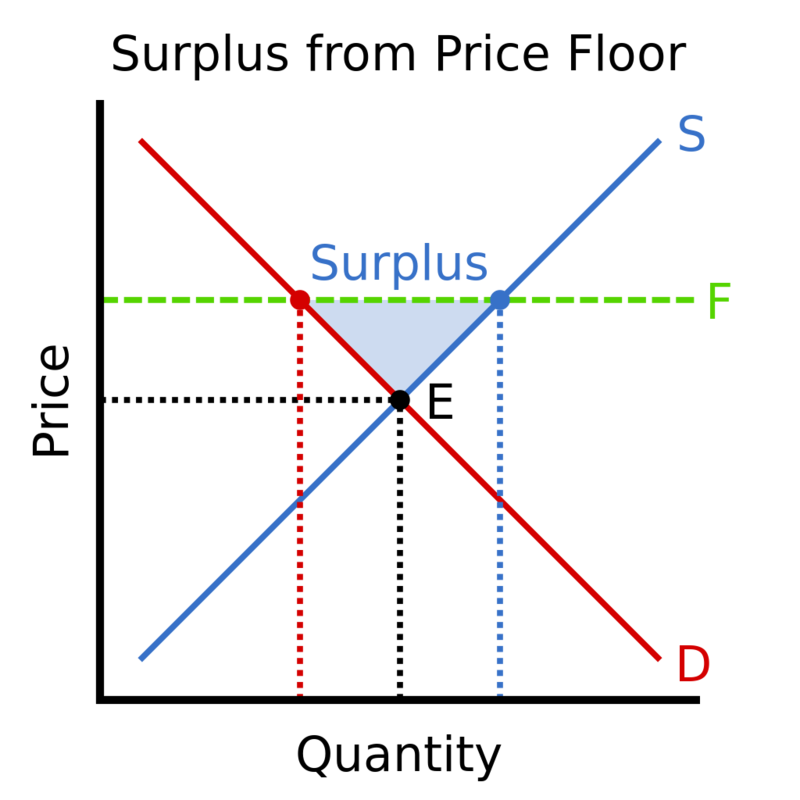 The part that’s labeled “surplus” is the surplus labor, i.e., the extra unemployed people. No , it’s not that complicated, Ted. Rent control typically has an exemption for new construction. So the production of housing is not affected. In fact, rent control tends to increase the housing supply since some of the money that would go into buying and selling existing buildings ends up financing new construction..
Are you proposing “rent control” as some so-far unarticulated “typical” program, or are you proposing to reinstate what was rejected in 1994? I ask because on one hand you cite the 1994 regulation as an apparent success story, yet you now seem to propose something different. I also note that, as is typical of today’s Boston Globe, the reporting so far has absolutely NO specifics about what is actually being proposed. That makes it very hard to have anything but the kind of content-free argument that we’re drifting towards here. This discussion will be easier if we have a concrete proposal to talk about. Every rent control law and every proposal that I knew about from 1980 to 1994 had an exemption for new construction. I’m going on the assumption that this new bill will be similar. As far as “drifting” toward a content-free discussion, that’s exactly why I described Charlie Baker as a robot and compared him to Annie Dookhan. Baker has no concrete proposal to evaluate. but he has an opinion set in concrete. I have been unable to find ANY specifics about what Mr. Connolly is actually proposing. There’s nothing wrong with Mr. Baker or anybody else being reluctant to sign up for a proposal that, at least at the moment, is nothing but a proposal to “effectively overturn the 1994 ballot initiative that outlawed rent control”. Will the proposed regulation exempt owner-occupied properties? How will its impact compare with the proposals I already described that are currently in play in Somerville? The voters expressed a strong opinion in 1994 (including the voters of Boston, Brookline, and Cambridge). In my view, it’s premature to have this discussion until there is a concrete proposal to consider (no pun intended). Baloney. Voters in Boston, Brookline, and Cambridge strongly approved retaining rent control. Rent control was outlawed because they were outvoted statewide by other communities. Check the numbers, Tom. Make a graph if you want. “. In my view, it’s premature to have this discussion until there is a concrete proposal to consider (no pun intended).”. Premature? Tom, maybe you shouldn’t have commented 17 times about how terrible the proposal is. More smoke and bluster. You seem to be demanding a blank check, labeled “rent control”. You are correct that I misremembered the results of the vote in Boston, Brookline, and Cambridge. I apologize. The vote was lopsided in one way, though. Only Boston, Brookline and Cambridge voted — in large numbers — to keep rent control legal. The rest of the state voted to abolish it. The demise is scheduled for New Year’s Day. 1. Right-of-first-refusal for condo conversions: This slows down the rush of speculators who buy distressed (and affordable) properties, kick out the tenants, do a slap-dash “renovation”, and resell the resulting condos for a million or so each. Some sort of regulation on airbnb and similar short-term rentals is really important — those are a huge contributor to the skyrocketing rents. The bottom line, though, remains that the issue in our economy is wealth concentration. While wealth concentration is at historic highs, nobody is going to be able to afford housing. Nobody. Elizabeth Warren understands this. The proponents of rent control do not. Yes, and the question is how do we limit wealth concentration? Taxing it is one solution but that is treating the symptom, not the disease. Requiring that all laborers be paid a sustainable wage would attack the problem at its source. Most of the uber wealthy inherit their wealth. So far as I know, the gift and estate tax is the only mechanism we have invented so far (except the guillotine, of course) that addresses that mechanism. The disease is the extreme concentration of wealth at the very top of the wealth distribution. A good definition of being “wealthy” is when the income from accumulated wealth exceeds the ongoing expenses of the household. Once that threshold is crossed, then any and all income serves to increase the wealth. Income and expenses become irrelevant, as do income taxes and expense taxes. The issue with wealth concentration is not that too many people are wealthy. It is, instead, that a very tiny portion of the wealthy have nearly all of the wealth. THAT is the problem that must be solved. That, too, is a natural and observed consequence of the behavior of unregulated wealth distribution networks. The term of art is “preferential attachment” — a new node in the wealth distribution network (a new household, for example) is more likely to attach to a wealthy node than a not-wealthy node. A wealthy hedge fund manager is more likely to acquire LinkedIn connections than a struggling photographer. Taxes on wealth are among the most effective of government tools to regulate those networks. American tax policy has, since the Reagan era, strongly reflected GOP dogma. Our extreme wealth concentration problem is, in fact, the obvious and predicted outcome of GOP dogma that worships an unregulated free market. Sustainable wages have nothing to do with wealth concentration. The wealthy don’t care about wages — not needing or caring about wages is, in fact, a defining characteristic of being wealthy. Many, including Karl Marx, argue that paying workers a sustainable wage is, in fact, the most effective way to ensure that said workers NEVER become wealthy. One of the more powerful motivators of FDR’s New Deal was the fear that suffering workers would embrace communism. The various wage relief programs were intended to blunt that threat (and seem to have worked). One of the failures of Marxism is that classical Marxist theory predicts that Marxism would happen first in heavily industrialized economies. In fact, it was the agrarian economies that first embraced it (cf Russia and China). These are good enough ideas, but they interfere with the market just as much as rent control. And whatever good they do is two or three steps away from benefiting tenants. If you are going to interfere in this market (which I’m all in favor of doing) do it in the most straightforward way possible instead of relying on all this trickle down stuff. I strongly disagree with you. You seem to be arguing that government action to use market incentives to adjust the equilibrium price of gasoline (such as gas taxes, carbon taxes, even ethanol requirements) “interfere with the market” just as much as outright price caps. And this has nothing whatsoever to do with “trickle down”. “Trickle down” refers to a fantasy that tax breaks given to the very wealthy will magically cause them to put more money into the economy. It’s nonsense and has absolutely no relevance to this discussion. It is a fantasy to think that lower rents will magically trickle down to tenants because of some combination of “market incentives” have somehow increased the supply of housing. Are you seriously arguing that the effects of government intervention in gasoline taxes on the gas market — and therefore the automobile market — is “magic”? Do you deny that gas is more expensive in Europe, automobiles smaller, public transportation better and more available, all because of this “magical” intervention? You’re just throwing stuff at the wall to see what sticks. Please return when you have a serious contribution to offer. Exactly my point. Europe has gas taxes but they also have public transportation. They didn’t pass a gas tax and just assume that transportation would take care of itself. That would be trickle down economics–just like you are proposing here. Europe does not have explicit price controls on gas. You are passionately advocating for explicit price controls on rent. Europe has public transportation because they long ago recognized the importance of regional transportation planning — that recognition is why the gas taxes are in place. Rent control, like price control, simply doesn’t work. It worsens the problem it purports to solve (as tedf has noted twice on this thread). Price controls have been tried in a variety of situations, eg utilities, insurance, and medical costs. Sometimes they work, sometimes they don’t; mostly the results are somewhere in between..
That’s why (if you remember my post, way up at the top of this thread) I object to what Charlie Baker said. Your reference to the Somerville proposals reminds me of the guy who found a claim ticket for a pair of shoes that he had left for repair twenty five years ago and forgotten. Just for the hell of it, he takes the ticket to the shoe repair place. The shoemaker looks at the ticket and says. “They’ll be ready next Tuesday. I invite you to offer an example where explicit price controls worked. I’ve already enumerated several where they failed (US wage freezes, several attempts to freeze US gas prices). Massachusetts regulated auto insurance prices for awhile. That was ended because insurers stopped writing auto policies (see the figures provided by tedf above). Note that price regulation that strives to regulate prices at or near the supply/demand equilibrium point are more likely to succeed. An example of that is the state efforts to set health insurance rates each year. The issue with rent control is the delta between the explicit price and the supply./demand equilibrium point. I don’t agree with your contention about stifling production of new housing at all. The primary effect of rent control is to cap the rental revenue of a given property. That has the effect of capping its market value. That cap on market value for residential construction immediately biases the market away from residential construction and towards other forms. The result is that construction of new housing is suppressed. Your attempted shoemaker analogy makes no sense to me at all, I don’t see the relevance. 3. UBI. Sure. We can start small. We ought to even list Sarah Palin’s Alaska as a reference. Most Alaskans seem to prefer it. 4. Single Payer Health Care? You bet! 5. Child Care? Well, yes, but only if we also give monetary incentives to those who want to stay home and take care of their own children prior to the K-12 years. I will try one more time. If new residential construction is exempt from rent control, there is no cap on market value for residential construction. Ted is free to apply his graph to new construction because new construction exempt from price controls. As to your statement that “price controls never work” you’ve debunked that yourself in your comment above, by describing the conditions where it does work and providing examples. Thanks. Rent control “works” if it protects tenants from being displaced through rent increases. That’s what it is intended to do and nobody has made a case that it doesn’t protect tenants. There may be side effects, but nobody, not you Ted, nor Charlie Baker has raised any that are valid. The one exception is your threat to hold your nose, but I can live with that. Sigh. Let me try this a different way. If the contemplated rent control ordinance has the aggregate effect of setting rents below the equilibrium point, the various problems identified earlier will occur. A rent control price that is not significantly below the equilibrium price will not produce any of the benefits you seek. You’ve still offered only hand-waving about what it is you want, and little more than foot-stamping and table-pounding when asked about specifics. Several of us have made these and related points several times. The fact that you refuse to admit the obvious facts don’t make them less valid. In my view, the value of analysis like this is that allows us to abstract away all those complications you mention. The graph presents what actually happens when actual renters and actual landlords interact. We might not like the results, but they’re still valid. By the way, the price of gas on a street corner is a classic text-book example of the above curve. That is a similarly complex environment, and yet behaves pretty much exactly as implied by the above analysis. In the case of gasoline, it’s helpful to remember how the dynamic works. The gas station owner or manager has a large underground tank that has to have gas in it for the station to stay open. The owner knows how much it cost the last time that tank was filled. As cars buy gas, the owner has to estimate what it will cost to buy the next tankerload. If the owner sets the price too high, then customers will buy at the station across the street. If he or she sets too low, then there won’t be enough money to refill the underground tank. All the gas stations in a given neighborhood end up with their gas prices within a few pennies of each other — even though they have varying and complicated mechanisms for acquiring and paying for their product. Each gas station owner or manager buys their product about once month. They look VERY carefully, typically each day, at what they think the next tanker-load of product will cost them. If that cost is going down for them, it’s probably going down for their competitors. So each day is a guess. The guesses compound, so that as the end of the month approaches the owner gets a better and better idea of whether the next tanker-load will be profitable or not. It’s a rigorous cut-throat example of supply-and-demand in action. That’s why (micro) economists study it. It is worth noting that the government has attempted price controls on gasoline several times, each with disastrous results (results predicted fairly precisely by the above figure). Math is wondrous thing, even if it’s hard. The math involved here is just not that complicated. I was taught the above analysis in a one-semester introductory economics course as an undergraduate 40 years ago. The fundamentals remain identical. It’s wages as well. Yes, rents are rising and causing misery for many, but wages are also stagnant or not rising along at the same rate as rents, so there’s the problem. The markets are failing and to market supporters like Baker the Republican and many of our neoliberal Democrats, the answer to failing markets is……..bigger markets. Anecdotally, I can recall when I worked as a dispatcher for a service company and we had a hard time finding technicians who lived in many of the areas that we had to service. That meant long travel times that the customers did not like paying. This is a real problem for many companies. Of course there is the real estate angle there as well any many prominent actors in the real estate field are big donors to both parties……so there’s that. First the Trumpists screw us with a cap on mortgage interest and property tax deductions. Now some Democrats apparently think destroying the value of residential income property is a good idea (notwithstanding that the market dynamics are the same as when it was tried and failed 20 years ago). Attempting to impose a cap on what I can charge my tenants (who rent my downstairs apartment) is a REALLY good way to make me hold my nose and vote against ANY alleged Democrat who proposes it. The housing affordability crisis is not caused by evil landlords jacking up rent. Destroying the investment value of local property owners who want to maintain their properties is a great way to create slums. There is a relatively long list of much more effective ways government can address the housing affordability crisis. Re-imposing rent control is not on that list. “First the Trumpists screw us with a cap on mortgage interest and property tax deductions. What do you mean “us”? I mean middle-class property owners and property tax payers of Massachusetts, New York, Connecticut, and New Jersey (and California, of course). My point is that we have had twenty-five years to see how rents would come down with various free market solutions. Nothing has worked. The people who sold us the free market as a solution should tell us why, instead of trotting out the same stale arguments they used before 1994.. I think the proper comparison is to compare today’s scenario with what would have happened had the rent control laws of 1994 stayed in place. We don’t have the data to do that. I don’t remember anybody saying — or desiring — that rents would come down. I don’t know of any property owner who wants rents to come down. I don’t know of any property owner who wants the market value of their property to decline. I think the issue is NOT that rents are too high. I think the issue is, instead, that too few people — especially young people — have the ability to pay those rents. This is pure nonsense. Do you understand what “equilibrium” means? “The equilibrium price is the price of a good or service when the supply of it is equal to the demand for it in the market.” Your contention that rents are not too high, but nobody can afford to pay them is a contradiction in terms. Pure nonsense. My contention is that the equilibrium price of rent has settled at a place where too few people can afford to pay for housing. That’s no contradiction, it’s a simple summary of your own contention. The figure above has two curves — one, the demand for apartments from renters for apartments at a given price, and the other the supply of apartments from landlords at a given price. What price control does (whatever the quantity) is set a price point different from the equilibrium point. The figure above from tedf shows this fairly clearly. There are two ways to make housing more affordable for renters. One is to make it cost less. The other is to increase their income. No contradiction, just simple algebra. A business that wants to become more profitable has two strategic choices — increase revenue by increasing sales or decrease costs by slashing internal spending. Successful businesses nearly always choose the first. Failing businesses, hedge funds, and the MBTA nearly always choose the second. A renter who is making $10K a month is less likely to object to paying $2K a month in rent than a renter who is making $4K per month. What part of that is hard to understand or contradictory? Rent control seeks to lower the rent. The proposals I’m making seek to increase the income of the renter. Both operate on the same supply/demand curve, but with very different elasticity graphs for the demand. What we do know is that housing prices in Boston, Brookline, and Cambridge climbed dramatically between 1974 and 1994. So the rent control laws that were rejected in 1994 did not stop the rise in housing prices. They also did not stop the rate of rent increases. What they did, instead, was to reduce the supply of apartments (duh, big surprise there). Ham-handed attempts to regulate rents don’t work. What is needed are mechanisms to put more wealth in the hands of young people. When I started working in 1974, my starting salary was about $1K/month. My first apartment, a brand-new 1-BR at 270 Babcock Street in Brookline, cost me $290/month. That’s a first ratio of 29%. That same apartment costs about $2,000/month today. How many people today graduate from college — with ANY degree — with a starting salary of $82.5K? That’s what’s needed to preserve that 29% first ratio today. So the rent on that apartment has increased by 35% (in inflation-adjusted dollars). That’s less than 1% per year. That doesn’t look like an out-of-control rent increase to me. What jumps out at me is the gap between my inflation-adjusted starting salary in 1974 and what a graduating student with a BSEE can expect today (never mind that I graduated with no student loans and had no financial assistance). According to this salary resource, the average starting salary for a BSEE today is $64.3K-$74.8K. That’s essentially the same as my inflation-adjusted 1974 starting salary. In my view, the problem is that wages and salaries have not risen to keep pace with housing costs. Hey editors, my new comment on this post got caught in your spam, would you check, please? Thank you!!! Can someone please explain how supply and demand makes prices go down? The governor says we need to build more housing, but why would the new housing come onto the market at a lower price than the existing housing? There is nothing in his alleged ‘solution’ to cause pricing to go down. In city after city we hear that building more housing will make housing more affordable. Where is this mythical marketplace result? Surely there must be one example of this policy success by now where housing is plentiful and affordable. I am really interested in the mechanics of how a landlord, or any business, buys at a high price and then sells it for less..
It’s Economics 101. If I have 100 widgets to sell, I will set a price that will make them likely to sell out. If I have 1000 widgets to sell I need to push them out faster to sell them out. I am thus likely to drop the price to get more people to relieve me of my supply faster. There is not just one price. 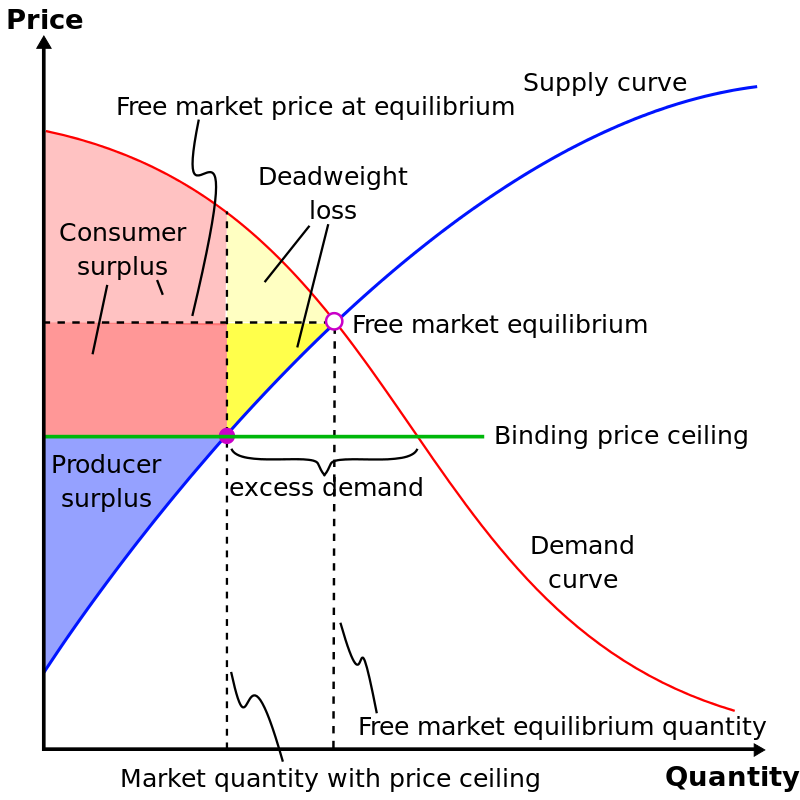 The “supply” curve describes a range of rents (and therefore property values) and how many units landlords and owners make available at each rent point (the “Supply” curve). Nobody is suggesting that a landlord or business will buy at a high price and then sell it for less. Instead, suppose a particular property comes on the market a some price. A prospective buyer has a choice of developing this hypothetical property as some number of condo or rental units — the question is how many. The prospective owner can make more money selling 5 units at $250,000 each ($1.25M) than 2 units @ $500,000 each ($1.0 M). The prospective owner might like to sell 5 units at $500,000 each, but the market is less likely to buy all five at that price. With the exception of unusual events like the crash of 2008, residential property prices tend to stay flat or increase at varying rates based on location. Prospective landlords and businesses therefore attempt to predict properties that will appreciate faster than comparable properties in their area. Landlords and businesses work very hard to avoid selling any property for a loss. They instead hope to sell for enough gain to cover whatever investment they’ve made in a property plus whatever year-to-year gain they seek.